If you’re a Tennessean just starting to plan for a career – or considering a new career – you can take heart. Indicators that show Tennessee, as a whole, is emerging as a job-friendly place with stable, good paying jobs with good benefits available. And that trend is expected to keep growing in the coming years. But here’s the tricky part: finding and landing a promising and sustainable job likely means narrowing your career preparation and search to specific fields. If you are preparing for a competitive job in a sought-after field such as accounting, financial services, computers and technology, health care or engineering, you’ll want to shop around. Competition for qualified candidates in these fields is fierce, which means some companies and organizations sweeten the pot with attractive benefits and amenities. Furthermore, your prospects for landing that plum job are probably highest if you live near an urban area, particularly the Metro Nashville area, where, as of early August, there are about 39,000 jobs listed online at the Tennessee Department of Labor and Workforce Development (TDLWD) website. Knox County has about 9,400 ads for jobs posted online, followed by Shelby County with 16,000 and Hamilton County with 7,100. The Nashville area statistics cover a wide geographical area and include jobs openings in Davidson, Williamson, Rutherford, Montgomery and Sumner County, while the numbers for Knox, Hamilton and Shelby counties do not count for suburbs outside of those counties. Further evidence of Tennessee’s job growth came earlier this month when the state was named No. 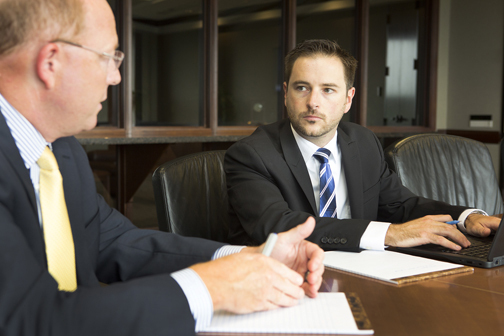 1 among U.S. states for advanced industry job growth since 2013 by the Brookings Institute, a widely-respected public policy think tank based in Washington, D.C.
Michael Royer, right, a staff accountant, listens intently to his mentor, John Mark McDougal, shareholder-in-charge at LBMC. “I wanted to pursue a career that would make me marketable in the business world,’’ says Royer, who transitioned from a career in music to accounting. Also relevant to job growth is the unemployment rate, which was 4.1 percent in June, well below the national average of 4.9 percent. From 2013 to 2015, Brookings numbers show, Tennessee’s advanced industry jobs increased by an average of 4.6 percent annually, a figure that outpaces the national average of 2.46. Randy Boyd, commissioner of the Department of Economic and Community Development, sees the rating as evidence that the state is making progress in its goals to make Tennessee the No. 1 location in the Southeast for high quality jobs. “TNECD is coming off back-to-back years of record job commitments from our corporate partners,” Boyd says. Advanced industries employ 249,617 full-time workers in Tennessee, according to Brookings, or 8.3 percent of all jobs in the Volunteer State. These direct jobs support an additional 199,690 indirect jobs in other industries across the state. Advanced industry jobs in Tennessee pay $70,784 on average per year, considerably higher than the average salary for all industries statewide last year of $45,696. These jobs are available across multiple sectors, including manufacturing, energy, technology and business services. Brookings also found the Nashville Metropolitan region ranked No. 1 among the 100 largest metro areas in the U.S. for advanced industry job growth from 2013 to 2015. Nashville’s average annual job growth among advanced industries was 7.9 percent. Brookings defines advanced industry companies as companies that spend at least $450 per worker annually on research and development and employ at least 20 percent of their workforce in STEM-intensive occupations. STEM, a commonly used acronym, stands for science, technology, engineering and math. Advanced industry jobs occur across multiple sectors, including manufacturing, energy, technology and business services. 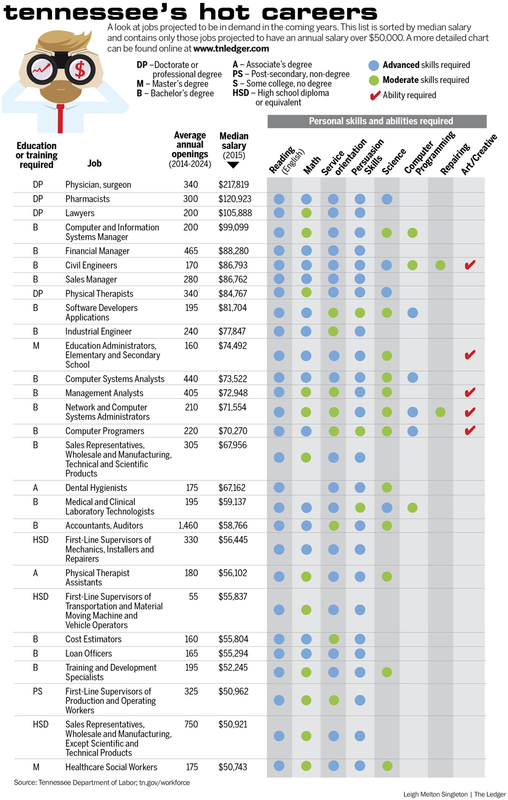 According to “Tennessee’s Hot Careers to 2024,” a survey conducted by TDLWD, the most in-demand and highest paying jobs in the state cluster around professions that require skills and expertise in computers and technology, finance, health care and education. Having a four-year or advanced degree is, more often than not, a requirement for securing the most-competitive and highest-paying jobs. But some jobs, particularly skilled labor positions in advanced manufacturing, can offer salaries comparable to traditional engineers with a four-year degree. The bottom line: if you want a good, secure job that keeps you interested and engaged, you don’t necessarily need a freshly-minted degree from Vanderbilt University or the University of Tennessee. But, unless you are in a field such as sales, you will almost certainly need a two-year degree from a community college or training from one of Tennessee’s 27 colleges of applied technology. And, although traditional jobs such as teachers, social workers and sales reps remain in high demand in Tennessee, there’s no doubt an overwhelming demand for STEM-related careers that offer highly attractive starting salaries and great opportunities for advancement. 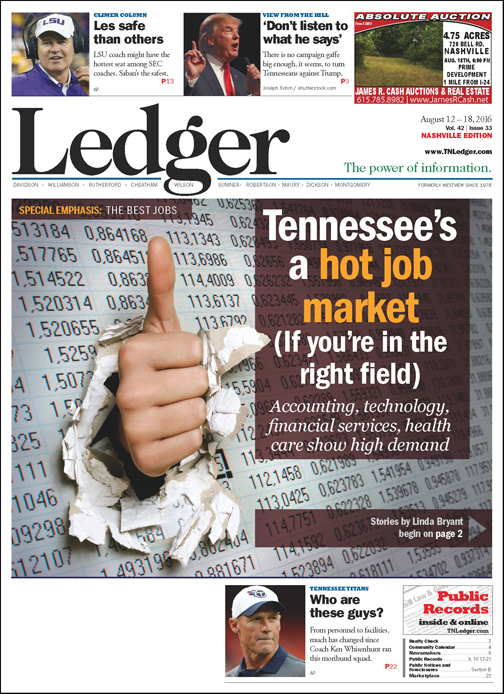 The Ledger spoke with a sampling of professionals and experts in Nashville and Knoxville about the fine details about the state’s most promising jobs. Jessica Utley, director of human relations at LBMC, an accounting and business consulting firm with offices in Nashville, Knoxville and Chattanooga, says the demand for accountants is so strong that the firm reaches out to students before they graduate from college. “[Accounting] can be a very lucrative career, and Nashville offers a tremendous market,” Utley says, adding that other large accounting firms in the region have similar recruiting efforts. By the time a new accountant starts at LBMC, he or she would have likely experienced an internship at the firm and been mentored by a staff member. To stay competitive, the firm adds perks and benefits. For example, employees receive an eight-week maternity leave and a two-week paternity leave. Even with the outreach, there are often more job openings than qualified candidates, but Utley says the image of accounting as a boring career is quickly changing, especially because millennials are embracing it. “Our young professionals group went rafting in Chattanooga two weeks ago. They are a lot of fun,” Utley adds. 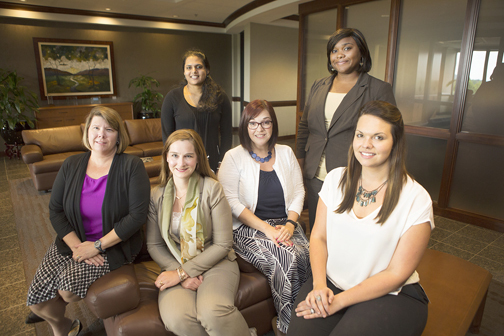 Women in technology at LBMC and LBMC Family of companies include, from left, Valerie Blackburn, Mindy Vail, Puja Vemuri, Wendy Pennell, Anndra Jackson and Kimberly Hammond. Michael Royer, 29, took a job at LMBC seven months ago after a three-month internship. Royer had taken accounting classes in college but didn’t actually earn an accounting degree. LBMC gave him a chance anyway. Royer took the first two parts of the CPA exam before starting with LBMC. LBMC reimbursed him for the final two sections of the exam after he passed. Ranstad, a national staffing organization, states there’s an average of over 400,000 health care job openings at any given time across the U.S. The competition for these jobs is formidable: Ranstad estimates an average of 43 candidates per job opening and that health care jobs stay vacant for almost two months. Jinny Dione, 56, retired from her previous job as an emergency dispatcher and decided to return to finish her college degree in 2015. The decision came after she felt “a calling” to become a nurse. A TNECD “Hot Jobs” survey shows there’s a high statewide demand for an array of health care professions. Physicians and surgeons, physician’s assistants, nurse practitioners, pharmacists, physical therapists, nurses, medical technologists, dental hygienists and health care social workers are all on the list. Although health care careers can be stressful, they are perennially counted among the most promising careers because they are usually highly stable and come with competitive salaries. They also offer the chance to make people’s lives better. 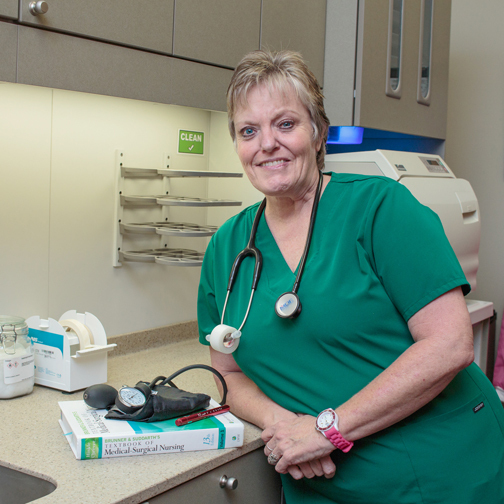 Jinny Dione, 56, decided to return to finish her college degree in 2015 after deciding she felt “a calling” to become a nurse. Dione, who lives in Powell, just north of Knoxville, enrolled in Tennessee Wesleyan University’s nursing program. TWU is in Athens, about 50 miles from Knoxville, but the school conducts its clinical instruction in Knoxville through partnerships with Covenant Health and Fort Sanders Medical Center. Dione retired from her previous job as an emergency dispatcher in Los Angeles and moved to Knox County to be near her daughter and grandchild. Now Dione can’t get enough. She’s made the dean’s list every semester. Art Fuller is president of Knowledge Academies in Antioch. “The more I get into nursing the more I love it,” she adds. “It’s such a great career for anyone with an interest in the human body and in helping other people. I think it’s something I was meant to do, and I plan to work in the field as long as I possibly can. “I want to tell everyone it’s never too late to find a great career you really love,” Dione adds. U.S. Department of Labor statistics show the median salary for a registered nurse is $67,000. It is estimated the profession will grow 16 percent between now and 2024 and add about 439,300 jobs. Advanced nursing degrees, such as nurse practitioner, bring in higher paychecks and average about $100,000. Another health care career high on the state’s list of in-demand jobs is physical therapist and physical therapist assistant. According to the U.S. Department of Labor, the profession is set to grow 30 percent by 2024 and add 71,000 jobs. The median pay is about $84,000. David Lehman, a professor of physical therapy at Tennessee State University, says the profession will continue to grow because of an overwhelming demand coming from the baby boomer population. “Physical therapists will forever be in demand as long as there is injury and illness in the human population,” Lehman points out. TSU offers the state’s only entry-level doctor of physical therapy (DPT) degree, which is offered in a three-year-format. “A clinical doctorate is not equivalent to an academic doctorate degree (i.e. PhD),” Lehman explains, adding that students of various ages and professions apply to the program. “Our program is a clinical entry level degree and only requires a bachelor’s degree to apply,” he says. Education careers are always high-demand in Tennessee, and that’s not about to change anytime soon. Also making the “Hot Jobs” list are middle and high school teachers and elementary and secondary school administrators. Fuller, who graduated from Oakland High School in Murfreesboro, initially studied pre-med at Wesleyan University in Middletown, Connecticut. 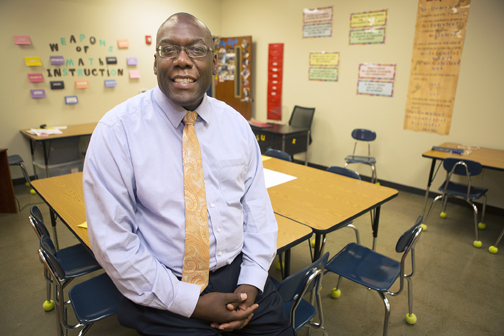 After teaching for a few years, Fuller decided he wanted to become an education leader and learn all he could about education reform, charter schools and innovative ways of improving outcomes in education. He earned a master’s degree, a certification to be a school principal and he worked at the state board of education for seven years. Launched in 2012, Knowledge Academies is a charter school that includes a middle school and a high school. The school, which serves minority and immigrant students and families, is housed at the location of a former Best Buy store at Hickory Hollow Mall. It has won numerous awards for innovation and excellence. “It’s very true that any career in education is always in demand,” Fuller points out. “You don’t get into education because you are looking to get rich, but the compensation and benefits are often quite good and the work-life balance can be nice. Fuller is particularly enthusiastic about education careers in charter schools — from teachers to administrators. “The charter school pathway is open,” Fuller adds. “You have a chance to pour your passion into impacting the lives of young people. The compensation is comparable [to traditional public schools]. It requires a lot of hard work and stick-to-it-ness. Although in some areas of the country the growth of engineering jobs is flat, this isn’t the case in Tennessee. The “Hot Jobs” survey shows there’s an ongoing need for engineers with four-year and advanced degrees for at least the next eight years. Civil engineering and industrial engineering, which have median salaries in the low $80,000’s, are among the most coveted positions. Oak Ridge National Lab, the Dept.of Energy’s largest science and energy laboratory, is one of the biggest drivers of engineering, advanced industry and STEM-related jobs in the state. With a staff of 4,600 and a budget of approximately $1.4 billion, ORNL hires 400 or more positions a year, including nuclear, electrical and mechanical engineers, computer scientists, information technology professionals, software developers, network administrators and trained technicians. All the aforementioned professions are on Tennessee’s “Hot Jobs” list. “We certainly hire many levels of engineering,” says David G. Lett, Human Resources manager for ORNL. ORNL also often hires technicians who support researchers, scientists and other professionals trained in at local community colleges. Such jobs, which require a two-year degree, have promising starting salaries of around $50,000.